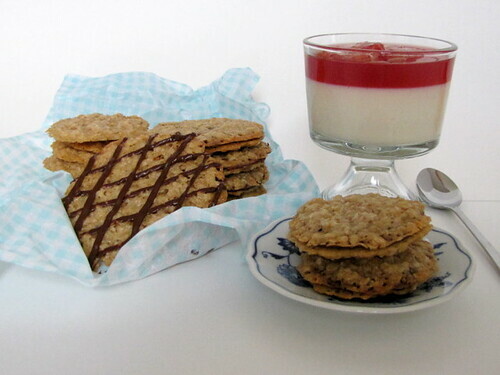 The Daring Bakers: Panna Cotta and Florentine Cookies ~ I Can Do That! All the recipes are here. Thanks MissMallory for coming up with this delightful challenge. I love having the panna cotta and Florentine cookies together, the contrasting textures of smooth, creamy, and crunchy are just perfect. I made the vanilla panna cotta and topped it with slightly bitter orange gelée, orange slices, and a drizzle of caramel sauce. For the Florentine cookies, I made some into milk chocolate filled sandwiches, drizzled some with chocolate, and rolled a few into cigar shape which is not an easy thing to do because they set pretty quickly. I bake 2 at a time in the toaster oven and use a small offset spatula to lift and guide the still warm and very fragile cookies onto the handle of a wooden spoon resting across the cookie sheet over the 2 cookies. And I couldn't resist making a panna cotta with my favorite Nutella. I crushed the cookies that broke and scattered them on the plate. The crumbs add a crunch to the creamy panna cotta. In a medium bowl, whisk gelatin with 4 tablespoons cold water. Place chopped chocolate in another medium bowl. In a large bowl, combine Nutella and salt. In a small saucepan over medium heat, bring cream to a boil. Pour half the cream over gelatin mixture and whisk gently to combine; stir in vanilla. Pour remaining cream over chopped chocolate; whisk until smooth. Combine the two mixtures and whisk well. Pour a third of the gelatin-chocolate mixture over Nutella; beat using an electric mixer on low speed until a smooth paste forms. Pour in remaining mixture and milk; beat until fully combined. Strain through a fine-mesh sieve into six lightly oiled ramekins. Cover loosely with plastic wrap and chill in refrigerator until set, about six hours or overnight. Panna Cotta is one of my favorite desserts and I have a daughter who loves Nutella. Delicious. Those look great! I am a chocolate lover so I love your nutella version, but your vanilla with blood orange gelee looks great too. I also used a scoop to make my cookies even, but you were very patient to bake them 2 at a time in your toaster oven. Nice job on the challenge! 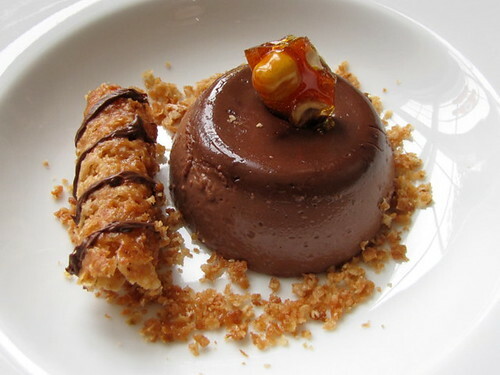 Yummy, nutella panna cotta! Beautifully done. Nutella Panna Cotta, gosh I'm drooling like crazy here! 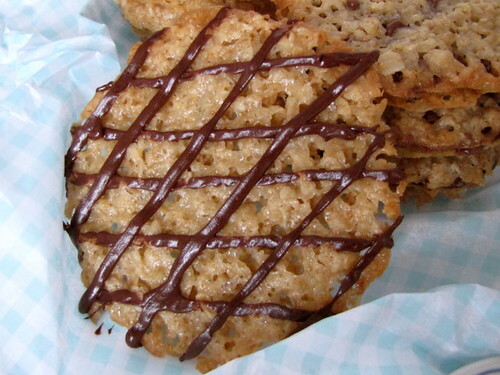 The curled up cookie is fabulous. Very well done! Wonderful presentation - I love the rolled florentine. That nutella panna cotta looks DIVINE!!!! great job! Such a pretty presentation of the challenge I love the flavour profile. Nutella is always a winner with everybody. Exquisite photography. I am so impressed with the results of your challenge - the panna cotta and florentines look wonderful. I am most impressed, though, that you baked the florentines two at a time in the toaster, had the patience to roll them, and that they all came out so beautifully. Really great job. 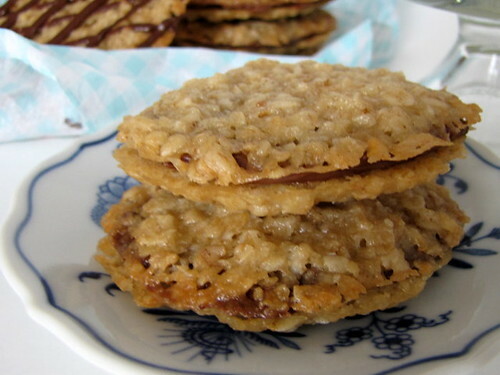 Your florentines look impressive. Your photos are so fresh and simple, love them. 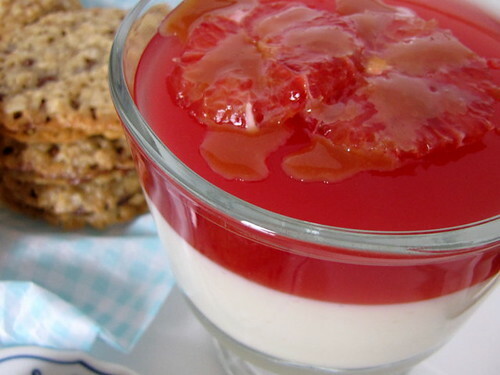 The blood orange gelee looks gorgeous, but I'm partial to the nutella panna cotta--looks so delicious! 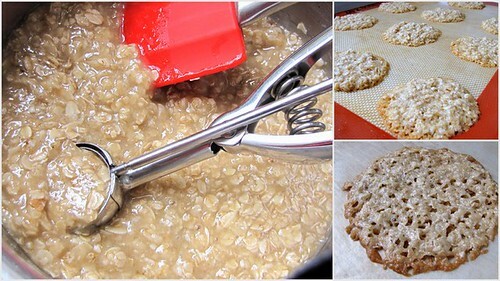 Your florentine cookies are perfect! I used blood oranges too but in the panna cotta. I skipped making a gelee. The nutella sounds awesome though. And I LOVED the rolled florentines. I tried doing that with terrible results. So I just cut them. Way to use the crumbles though in the final dish! Your photos are great too! Nutella panna cotta. Pure genius!